Flying fish esp. 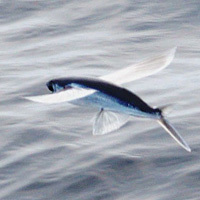 the Japanese flyingfish or tobiuo in Japanese is a type of fish known to appear to being flaying when it jumps out of the water. It has a miraculous jumping distance of around 500 meters. It can be eaten as sashimi at sushi restaurants. It is high in vitamin B12 in addition to niacin. The calories in Flying Fish per 180g(1fish small edible part) is 173 calories. Flying Fish is calculated to be 96Cal per 100 grams making 80Cal equivalent to 83.33g with 37.8g of mostly protein、1.26g of fat、0.18g of carbohydrates in 180g while being rich in vitamins and minerals such as Vitamin B12 and Niacin.